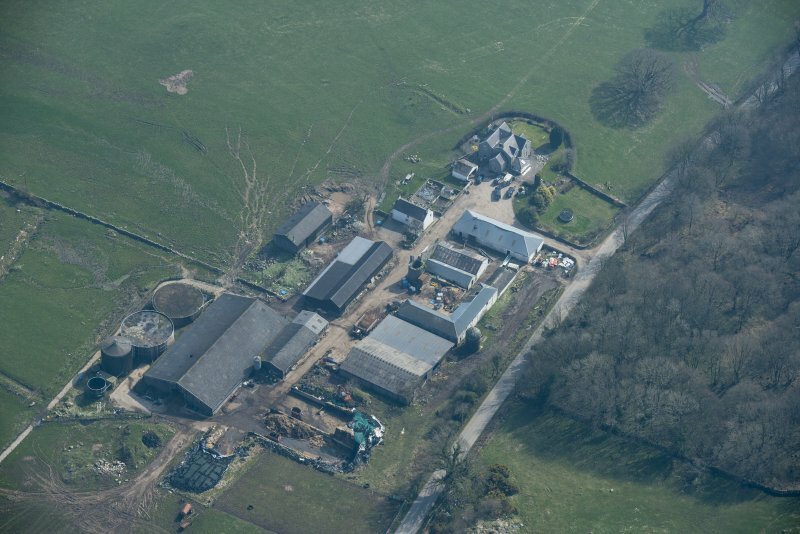 Oblique aerial view of Auchenskeock Castle and Farm, looking NNW. 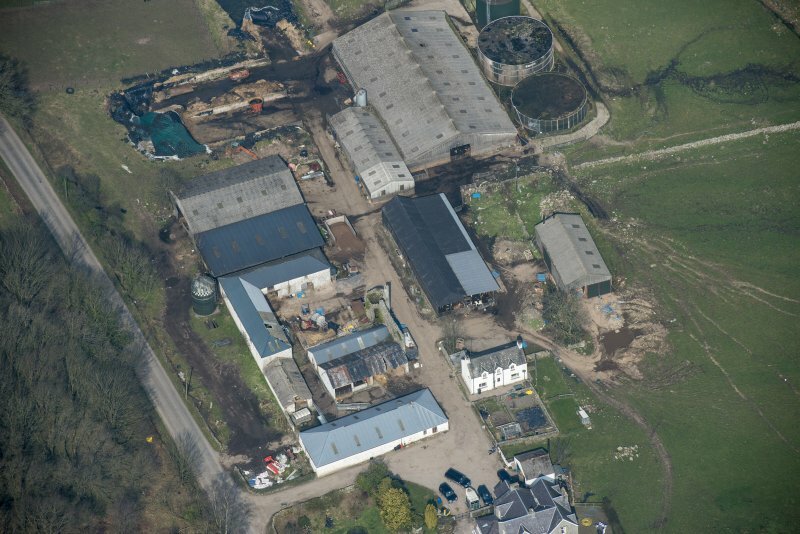 Oblique aerial view of Auchenskeock Castle and Farm, looking N.
Oblique aerial view of Auchenskeock Castle and Farm, looking WSW. 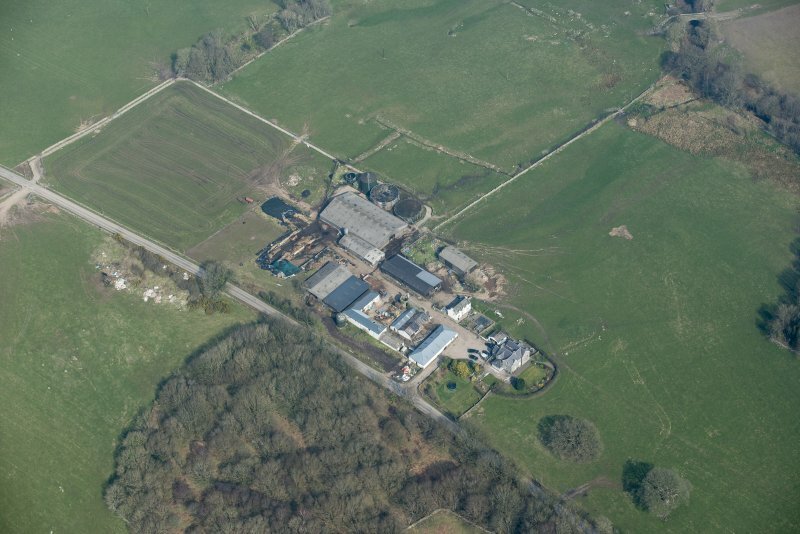 Oblique aerial view of Auchenskeock Castle and Farm, looking NE. 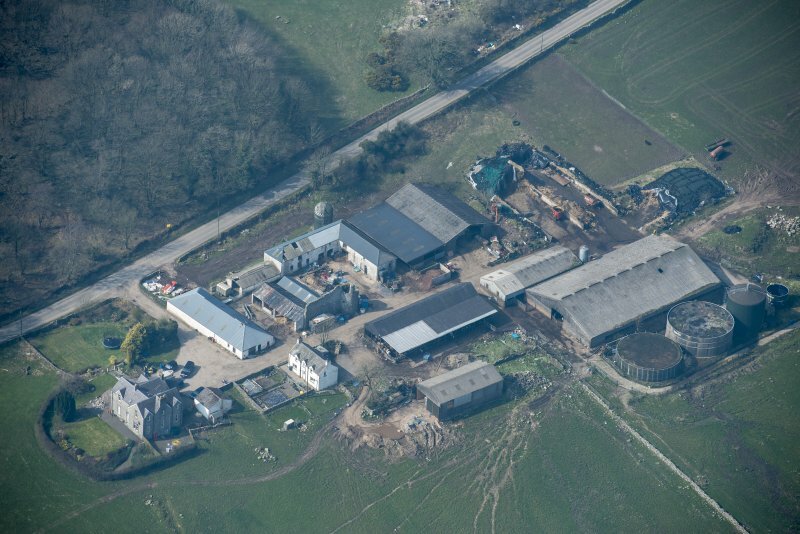 Oblique aerial view of Auchenskeock Castle and Farm, looking ENE. 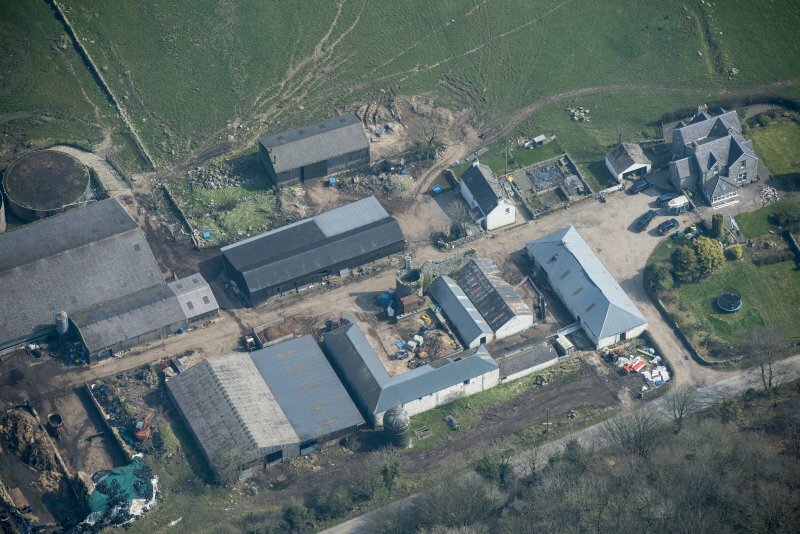 Oblique aerial view of Auchenskeock Castle and Farm, looking NW. 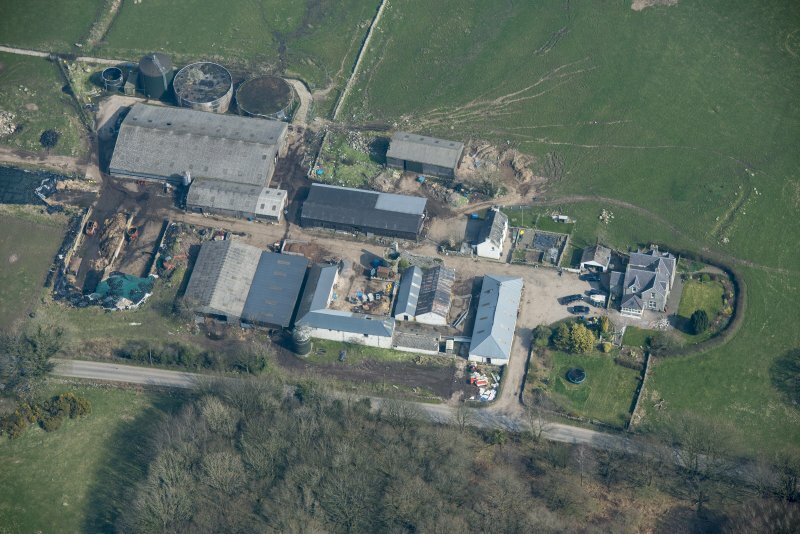 Oblique aerial view of Auchenskeock Castle and Farm, looking ESE. 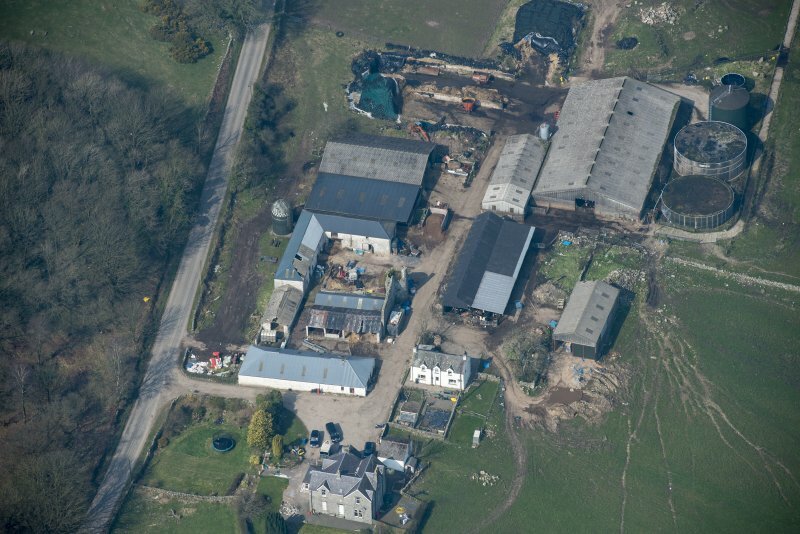 For surrounding farmsteading (Auchenskeoch Castle Farm), see also NX95NW	31.00. Auchenskeoch Castle: The remains of this castle are situated within the farm-steading of Auchenskeoch. The castle appears to have been on the Z - plan, and to date from the second half of the 16th century. The remaining portions consist of a circular tower, 10' in diameter, at the NW angle, from which two walls project to the east and south for a distance of about 37'6" respectively. The walls have a uniform thickness of 2'6" throughout, and an average height of about 20'. The ruin is now enclosed on the south by modern farm-sheds, and is in a neglected state. The remains of Auchenskeock Castle (the correct spelling of the name could not be confirmed) are generally as described above, except that the S wall has been demolished. The fabric of the remaining wall and tower is quite sound. Visited by OS (JTT) 11 August 1965.